Thank you for considering the Co-op Food Stores to retail your products. We’re always on the lookout for new and exciting products for our customers that will help the Co-op standout in the ever-changing food and grocery industry. In reviewing potential new products and vendors, we are especially interested in the product quality, quantity, price, availability, potential “fit” of the product into our mix, and wholesale distribution. The first step in being considered as a vendor at the Co-op is to submit a New Item Packet to our Merchandising Team. To do this, please fill out the online webform and follow our shipping guidelines listed below. We must receive a completed packet for your products to be considered. Please fill out the New Vendor Submission Webform to provide us key information to get your application started. After supplying us with your information, please send your product samples with the words “Attention: Co-op Food Stores Merchandising – New Item Information” written on the box. 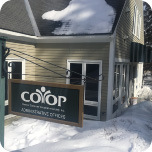 To ensure that we receive your product, it must be sent to the Co-op’s Administrative offices and depending on which shipping method you use, please take note the difference in addresses. View some frequently asked questions about becoming a vendor.